The Miami Beach oceanfront condominium demolition that killed a Lighthouse Point father last July used an “illegal, reckless” technique rejected by the city in a permit application, a lawsuit claims. Judith Landis of Lighthouse Point filed the lawsuit. She had to bury her son, Samuel Landis, after parts of the former Marlborough House building formed a concrete shower as he stood on Collins Avenue on July 23 while working for AlliedBean Demolition. The 46-year-old father of a teenage daughter lost a leg and died 11 days later from his injuries. Defendants in the lawsuit include Miami Beach Associates, which bought the Marlborough House to tear it down and build a new condominium; general contractor Winmar Construction; and the subcontractors that handled the demolition, AlliedBean Demolition and AA Demolition Management. 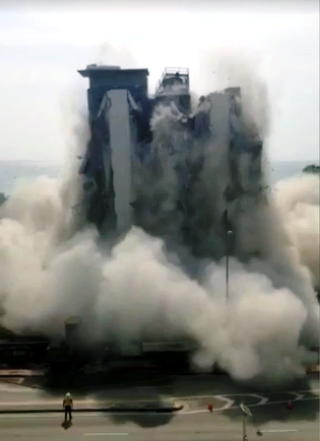 But implosion was used on July 23. The lawsuit says AlliedBean and AA Demolition went for “tripping the building,” yanking the supports out from under the building.